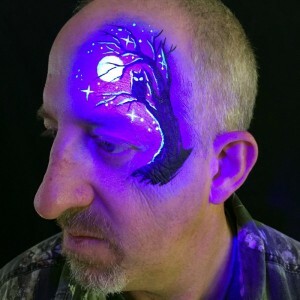 UV face paint: In the face and body painting world it seems that UV and luminous face paint products uv, are controversial. It seems that there are various opinions on the safety of the products. Gary Cole from Snazaroo has posted his opinion on the matter in his FAQ answering the question of whether these products are safe. The subject is covered in the above link at length. 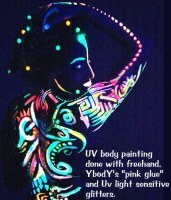 According to Gary Cole, of Snazaroo "The only FDA compliant UV paints for skin is Snazaroo. 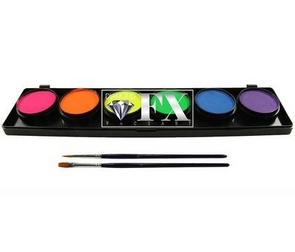 All other brands have a UV but it is not FDA compliant because of the pigments they use." According to the FDA (The Food and Drug administration of USA) you SHOULD NOT USE THEM ON SKIN. There are however many products on the market and equally many people who use them, that don't have a problem with them. I suppose its all a matter of amount of usage and relative danger. The chances of using such products often is in most cases pretty rare. The other point is that people using such products in clubs and raves are "exposed" (no pun intended)to far greater risks from the clubs and environment that they find themselves in. Considering all this there is quite an array of different products available. 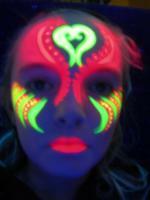 The UV Face paint designs of faces and bodies painted with these products create some amazing and different effects. With see through UV ink and then with a backlight. Kryolan UV-Dayglow Yellow Hair Spray is perfect for an instant, luminous color change on hair and wigs. 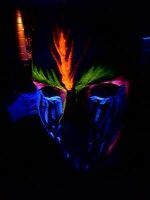 The temporary color fluoresces brilliantly under ultraviolet light, making it perfect for special black light effects. Ideal for use in bowling alleys, clubs or special events where UV lights are popularly used. Available in a 5 ounce (150 ml) spray can. To apply, hold nozzle around 12 inches from hair and spray. 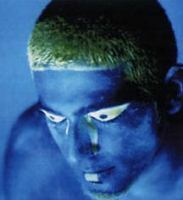 Kryolan Dayglow Color Spray can be washed off with shampoo and warm water. A strand test is recommended prior to application on bleached or dyed hair. Each 5 ounces (150 ml) container of Kryolan UV-Dayglow Hair Spray is good for about 2 to 3 full heads or 7-10 streaks and tips. 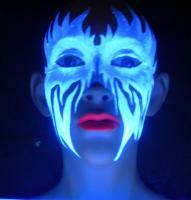 Kryolan Fluorescent Lipstick glow brilliantly under black light and is designed for black light makeup effects. It can be used on the hair or skin for fine detail body artwork. Brilliant Yellow, Bright Orange, Bright Green, Hot Pink, Deep Violet, Deep Blue, Bright Red. Please be sure to look closely at BOTH pictures that show the cream sticks in regular light AND in UV blacklight. 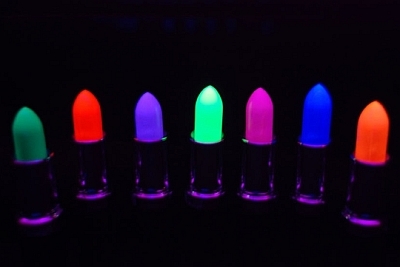 Some colors are a completely different shade in normal light than they are in UV blacklight. 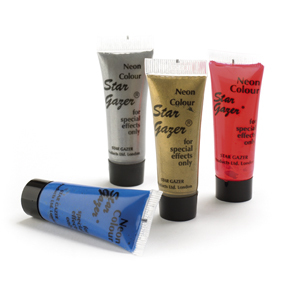 Small tubes of various colours of uv face paint, to be use for special effects, which also glow under uv light. 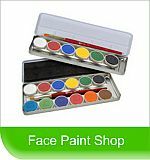 Using a fine brush you can decorate your face or body with any designs or body art. There are also gold and silver that have a metallic sheen when applied to the skin. These colours are easily removed with water. 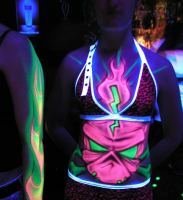 Here is a great website for Glow in the Dark Party ideas.